This is the second part of a three part essay on Hungarian violinist Stefi Geyer. Read the first part here and the third part here. 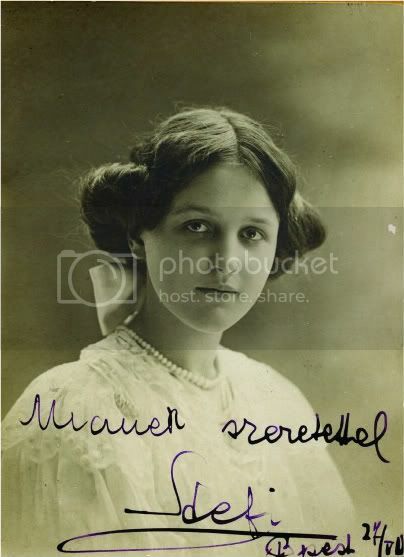 The nineteen-year-old Stefi Geyer was an extraordinary person and violinist. Even in a studio as crowded with talent as Hubay’s, she stood out as one of the conservatory’s most exceptional students. She had already played a wide variety of repertoire throughout Europe, and had even recorded in 1906, back in the days when recording consisted of playing an unedited take into a giant horn. She was very pretty, with blue eyes and blonde hair that she wore in two small buns on either side of her head. That beauty, combined with her grace, cleverness, and talent, proved alluring. On June or July 1, 1907 (depending on what source you read), Bartok began to write a violin concerto with Stefi in mind. He left Jaszbereny to continue gathering folk song in Transylvania, but the concerto - and the girl - was always in the back of his mind, as evidenced by the letters he wrote to Stefi that summer. The letters are long, passionate, and wide-ranging: they are Bartok at his most open and unguarded. We have lost Stefi’s replies, so it is a one-sided conversation, but even so, we learn a great deal about both of them. At the beginning of their relationship, he wrote mainly of music - Wagner, snippets of the concerto in-progress, the characteristics of the folksong he was studying - but by late summer, Bartok had moved beyond music to speak of his own personal beliefs about religion and society. "The middle class, which stands between the highest people and the peasant class, is, owing to its stupidity, actually unenjoyable. We like the childlike naivety of the peasants, which manifests itself in everything often with primitive strength; the intellectual strength of the highest people is impressive, but the idiocy of the middle class - including most of the ‘gentry’ - which lacks natural naivety, is insufferable," he wrote. This was probably not the wisest thing to write to a middle-class girl he wished to woo. He also encouraged her to break the bounds of tradition - "As regards tradition, it’s but holy gospel for average people. And the Stefi Geyers are born to eschew its yoke… I think that everyone, man and woman, if it is in one’s power, must fight against the bonds of tradition. This fight is actually but a striving for autonomy, to be independent of everyone or of everything, as well as to be in control of ourselves…"
In another exchange, they spoke of the morality of suicide. "I do not see why you should condemn suicide as such a cowardly act!" he wrote. "It’s quite the contrary… As long as my mother is alive, and as long as I have some interest in the world, I will not commit suicide. But beyond that? Once I have no responsibility toward any living person, once I live all by myself (never ‘wavering’ even then) - why should suicide be a cowardly act? It’s true, of course, that it would not be a deed of great daring, but it could not be dismissed as an act of cowardly indifference." All of this may have been totally honest on Bartok’s part - if less than tactful - but when he began complaining about, and almost mocking, Stefi’s treasured Catholic beliefs, it precluded any possibility of a romantic relationship. "If I ever crossed myself, it would signify ’In the name of Nature, Art and Science…’ Isn’t that enough?! Must you have the promised ’hereafter’ as well? That’s something I can’t understand." And then, rather condescendingly - "Will you allow me to supply you with reading matter from time to time?…You needn’t be afraid that reading will blight your youth; even if it were to shorten it, you would be amply compensated by all the pleasure you would get from it." And then, a few days later: "Why are you such a very weak person, and why are you afraid of reading and learning?! This is what drives me to despair… Would you still refuse to accept books from me even if I only gave you books in which there is merely a total lack of reference to god - or at least only pious reference?!" Finally, perhaps realizing that they both were both holding stubborn in their own beliefs, he wrote, "I would never attempt to talk you out of your faith, distressed though I am by your present state of mind. Move the first moment of crisis, you would relapse, I am sure --- Yes, let us drop the subject; we may discuss it again - at some later date, maybe, but not now." He signed one of these letters, "Greetings from AN UNBELIEVER (who is more honest than a great many believers)." Some historians, if they mention Geyer at all, imply that she toyed with Bartok. Sentences like "Violinist Stefi Geyer, whom friends remember as a dark, rapt beauty, a trifle spoiled by her early musical success, and more interested in her career than in young Bartok" are not uncommon (although, thankfully, that is an extreme example). But without having Stefi’s side of the story in writing, there is insufficient information to make such claims. The side of the correspondence that we do have - Bartok’s - makes it clear that their relationship was likely doomed from the beginning, thanks to a fundamental difference in worldviews. This fundamental difference didn’t matter to Bartok: despite them, he had fallen very deeply in love, although he surely sensed Stefi‘s hesitancy. "I have a sad misgiving that I shall never find any consolation in life save in music. For some time, I have been in a very strange mood, going from one extreme to the other. One letter from you, a line, even a word - and I am in a transport of joy, the next brings me almost to tears, it hurts so. What is to be the end of it all? And when? It is as if I am in a state of spiritual intoxication all the time." Throughout his turmoil, Bartok continued writing the concerto. The first movement was to be a portrait of Stefi Geyer as person and woman - "the idealized Stefi, celestial and inward," Bartok wrote. Stefi herself later described it as a portrait of "the young girl he loved." The movement is lush and romantic, with touches of Wagner. The gentle opening theme is pianissimo, and stated alone by the solo violin. Bartok Violin Concerto No 1, Part 1/2. Kyung Wha Chung, Chicago Symphony Orchestra & Sir Georg Solti. This first movement makes it clear that in Bartok’s ideal world, Stefi Geyer would be a gentle, acquiescent figure. One cannot help but think of the widely cited Victorian ideal of womanhood: the gentle, unassuming "angel of the house." Unfortunately for Bartok, Stefi Geyer had already defied that stereotype from an early age, simply by taking her violin studies seriously, and taking Europe by storm as a prodigy. The second movement was to represent Stefi Geyer as the elfish, witty, sparkling virtuoso violinist. "Cheerful, witty, and amusing," Bartok called it. Stefi referred to the movement as a tribute to "the violinist he admired." Its main theme is actually the theme of the first movement, only slightly tweaked and turned around. Once again, the violin enters by itself, but this time it is a brash forte, totally different in character from the theme of the innocent angelic girl. Notice the similarity to the first movement theme. Is this Bartok indulging in one last vain hope that the independent virtuoso violinist might succumb to the gentle, acquiescent, ideal girl? It is impossible to know. As the autumn progressed, the strains in their relationship became more and more obvious. Bartok wrote in late November 1907, after working on the first two movements, that "Now, I should compose a picture of the indifferent, cool, silent St. G. But this would be hateful music." Ten days later he wrote, "You are a dear, a good, a fairy-like, an enchanting girl! who has only to draw a few lines to chase the dark, grimly swirling clouds from the sky and makes the bright sun shine on me. - You are a taciturn, a bad, a cruel, a miserly girl! to begrudge me your powers of enchantment!" Finally he came to the conclusion - probably to Stefi’s relief - that he was not going to write the intended final "hateful" movement. But this decision didn’t keep Bartok from composing something to express his feelings over the failed relationship. The last of his Fourteen Bagatelles for piano is a bitter waltz that employs the theme from the violin concerto. He later orchestrated this and used it as the second movement - "Grotesque" - in the Two Portraits. (The First Portrait is basically the first movement of the violin concerto, so he was certainly thinking of Stefi as he wrote.) Some have even theorized that this "Grotesque" movement was originally conceived as the third movement to the concerto. Two Portraits, Op. 5. You'll notice this is basically the first movement of the violin concerto. And here's the second movement, Grotesque. Things only got worse between the two of them. In early February, Bartok finally finished the violin concerto. On the same day, Stefi Geyer wrote him that she could not consider courting or marrying him. He wrote, "I finished the score of the violin concerto on the 5th of February, the very day you were writing my death sentence… I locked it in my desk, I don’t know whether to destroy it or to keep it locked away until it is found after I die and the whole pile of papers, my declaration of love, your concerto, my best work are thrown out." But thankfully for us, instead of destroying the work, he mailed the manuscript - the only copy he had - to Stefi, inscribed with a line of poetry from Bela Balazs: "No two stars are as far apart as two human souls." Bartok would employ the poetry of Balazs in later compositions, including Bluebeard’s Castle and The Wooden Prince. Around this time, Bartok began writing his first string quartet. True to his word, in the first movement he employed Stefi’s "virtuosic" theme and turned it into a mournful dirge. The first movement of the first string quartet - the movement Bartok referred to as his funeral dirge. As no one but the two of them had seen the score to the violin concerto, audiences listening to the quartet were unaware of the significance of this first theme. They would, however, have recognized a quotation in the third movement of a popular art song called "Just A Fair Girl." Some historians have interpreted this as a defiant "toss of the head" to Stefi. The following year, in 1909, Bartok went on a walk with a teenaged girl named Marta Ziegler, one of his piano students at the conservatory. He had met Marta, the daughter of a member of the Budapest police force, at the age of fourteen. The similarities to Stefi are striking. After they returned from the walk, Bartok’s mother asked if sixteen-year-old Marta was staying for dinner. He answered that they had just gotten married. Bartok later dedicated the opera "Bluebeard’s Castle" to Marta. Even in this opera, there were traces of the "Stefi Geyer" theme, but by now it reminded him of more than just his first love: it served as a compositional shorthand for many complex emotions. As for Stefi, she kept the score to the violin concerto locked away among her papers, and although she occasionally spoke of it, she never performed it. In fact, there are indications it may have been sold at the end of her life to pay for her medical expenses. Part three of the essay chronicles Stefi’s later career, as well as the effect she had on Swiss composer Othmar Schoeck. Thanks! Very good work again! A brilliant composer .. but frankly, he sounds like a stalker. I'm impressed with all the research you did for this.Your writing grabs hold of me, and I read it eagerly. Great work! Best keep out of this one lads. I can see a big sharp hook waiting . Bartok ! Silly boy. I`m sure if he had explained all this to her parents they would have been overjoyed. Blue eyes and two liitle buns in her hair ? What more could you want ? I love Bartok's "Opus Posthumous" first violin concerto and actually did study it in school. You are making me want to dig it back out, Emily!